Welcome to the UK Guest Observer Support site for the ESA X-ray Multi-Mirror (XMM) mission. The UK Guest Observer Support activities draw upon the expertise of the two main UK participants in the XMM project, the University of Leicester (EPIC-MOS camera and the Survey Science Centre [SSC]) and the Mullard Space Science Laboratory (Optical Monitor [OM], Reflection Grating Spectrometer [RGS] and the SSC). 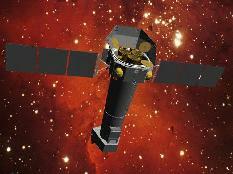 The X-ray Multi-Mirror (XMM) observatory is a cornerstone mission of ESA's horizon 2000 programme. It will be by far the most powerful X-ray observatory ever flown. The emphasis of XMM is on high-throughput spectroscopy: The observatory includes three co-aligned X-ray telescopes, each made up of 58 thin, closely packed grazing incidence mirrors which will have the EPIC and RGS detectors located at their foci. Coaligned with the three X-ray telescopes is the Optical Monitor. See this clickable XMM schematic view of how it all fits together now linking to our new instrument pages. The three X-ray telescopes together deliver an effective aperture of 4650 cm-2 at 1 keV (1 keV = 2.5x1017 Hz), and 2700 cm-2 at 5 keV, and a collecting area which spans the energy range between 0.1 keV and 15 keV (2x1016 to 4x1018 Hz). A typical exposure time of 30 to 50 ks will reach X-ray fluxes of approximately 10-15 erg cm-2 s-1 (0.1-10keV) - see the EPIC sensitivity plot. (Please note that the sensitivity values quoted here and the EPIC sensitivity plot are more optimistic than those given in the XMM Users' Handbook [UHB]. The UHB values are intentionally conservative whilst what we quote reflects the performance which we hope will be achieved). EPIC CCD Camera Each telescope has a CCD camera at its focus provided by the European Photon Imaging Camera (EPIC) consortium (PI: Martin Turner, Leicester). These deliver imaging spectroscopy with a resolution of E/delta(E)~100 at 6 keV over a 30 arc-minute diameter field of view. Two types of CCD camera are used which have complementary capabilities. One of the three XMM telescopes is fitted with an array of pn CCD chips, which emphasise photon throughput and overall energy response. The other two telescopes focus radiation onto arrays of MOS CCDs, which have a smaller physical pixel size than the pn CCDs and better sample the point-spread function of the telescope. Reflection Grating Spectrometer Two of the three X-ray telescopes, those which have EPIC-MOS CCD cameras, are also equipped with reflection gratings that disperse approximately half the radiation collected by the telescope onto a linear array of 9 CCD chips. This is the Reflection Grating Spectrometer (RGS; PI: A. C. Brinkman, Utrecht with MSSL as a Co-I group) which provides X-ray spectroscopy with a resolving power of between 100 and 600 in the energy range 0.35-2.5 keV. Optical Monitor A novel feature of XMM is the inclusion of an optical/UV telescope, the Optical Monitor (OM; PI Keith Mason, MSSL). This is designed to provide multi-wavelength monitoring of variable X-ray sources. The OM is co-aligned with the X-ray telescopes and will deliver sensitive optical and UV imaging data in the wavelength range 1700-6000 Å on each field that XMM observes. Full details of the instrumentation, the groups which developed them, the XMM Survey Science Centre (SSC), observation planning and proposal preparation are available from this site and the links therein. In the future as observations are made, information about data reduction and analysis techniques will also be available here. Any queries about the site may be addressed to the XMM Support teams at either Leicester (xmm_help@star.le.ac.uk) or MSSL (xmm_help@mssl.ucl.ac.uk).